Here at K2, we are passionate about all things design and workplace related, so have created this guide that looks at the office design trends that we expect to see more of during 2017, and beyond. The workplace today is utterly unrecognisable from the workplace of just a decade ago. Fuelled by the advancement of technology, staff now work in a variety of different ways and as a result, the workplace and subsequently, office design has had to adapt. Today, the modern workplace is flexible and centres around staff, providing them with the tools and space to be as productive, efficient and creative as possible. While many companies have fully embraced this approach, there are many playing catch up, as they realise the importance of creating a great place to work. The benefits of investing in the workplace are well documented, from increased productivity to greater staff retention, as well as making it easier to attract new staff, the workplace can be a very powerful tool. So, what next for the workplace and office design, how will it look in another decade? What are the big office design trends? Our clients continually ask us about the ‘next big thing’ and what that might be? 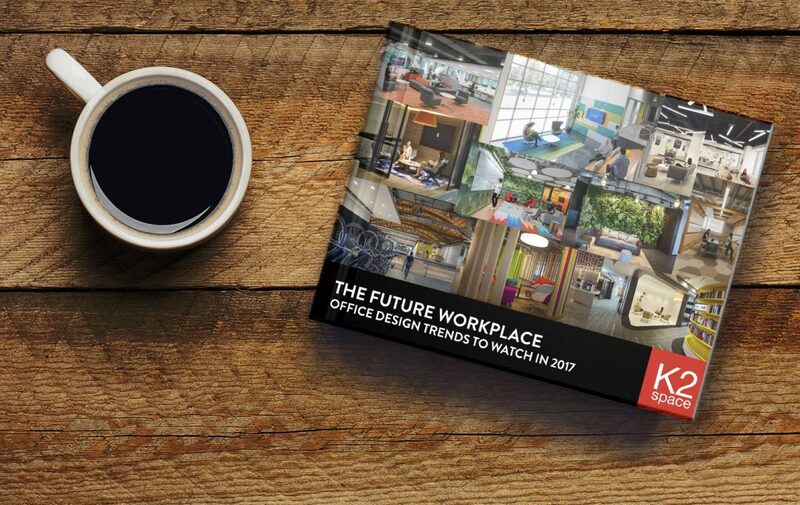 Mostly, they want to future-proof their workplace but there is no silver bullet response (as far as we know) and while we don’t have a crystal ball, this office design trends eBook is designed to highlight some office design trends that we think will become increasingly popular in 2017 (and beyond). The flexible, adaptable office isn’t a new phenomenon by any means but we do think flexibility will grow in importance as organisations strive to make the most efficient use of their available space. Allied to this, staff are spending more and more time away from their desk using laptops and tablets, which has led to the modern workplace becoming a vast array of areas designed for different types of work, from concentration to collaboration. This trend is set to continue with agile work practises on the rise as companies adopt new ways of working designed to attract staff, embrace workplace wellbeing and increase productivity. The adaptable office mirrors this increased need for flexibility as companies create teams to deliver specific projects, resulting in the office needing to constantly adapt to different team sizes and layouts. The goal from an office design perspective is to create a space that can easily adapt in line with changing requirements, and smart space planning and furniture choices can play a major part in achieving this. A trend that needs little explanation as technology becomes the great workplace enabler. How we work today will alter significantly as technology advances and new, more efficient ways of working are introduced. 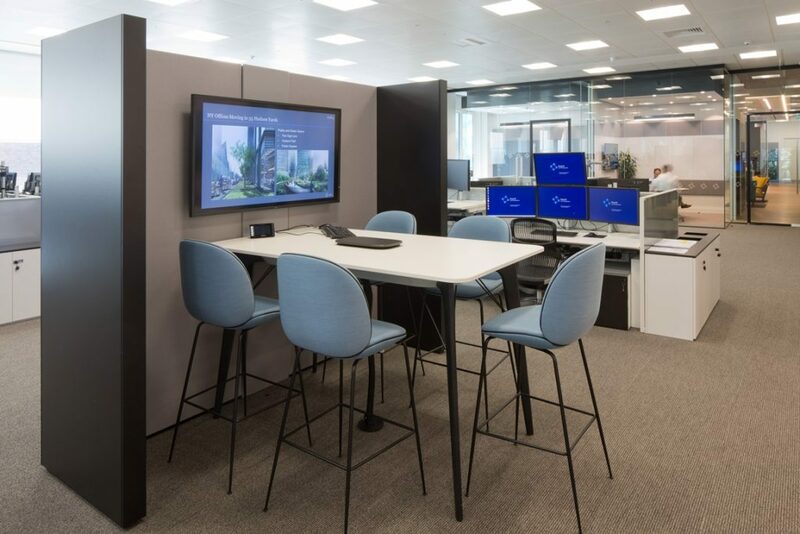 As a result, companies are increasingly investigating ways that they can integrate technology into different areas of the office, including furniture with screens to facilitate presentations and collaboration to smart receptions and pods that enable staff to use thin client devices. Collaboration furniture with embedded technology is becoming more popular and many now come, not only with screens but also wireless screen sharing capabilities and charging ports. Likewise, smartboards are allowing teams staff to collaborate more effectively as well as providing the option to send a copy of all notes, sketches and doodles as an email afterwards, are becoming more commonplace. This has allowed staff to move further away from traditional desk based work, decreasing the personal space needed per worker (another trend). Embedded technology facilitates an increased level of flexibility enabling staff to work, present and/or collaborate almost anywhere in what will be a fully digitally enabled work environment. Another factor worth referencing here is the emergence of the blended workforce or gig economy, where permanent staff and freelancers work together to deliver projects from the same office. To accommodate this, the office needs to be first of all flexible to facilitate increased headcount and provide technology and tools that allow these project teams to work together seamlessly. All of these factors will force companies to investigate embedding tech into every area of the workplace – watch this space, and that’s before we even mention virtual reality, sensor technology or 3D printing. 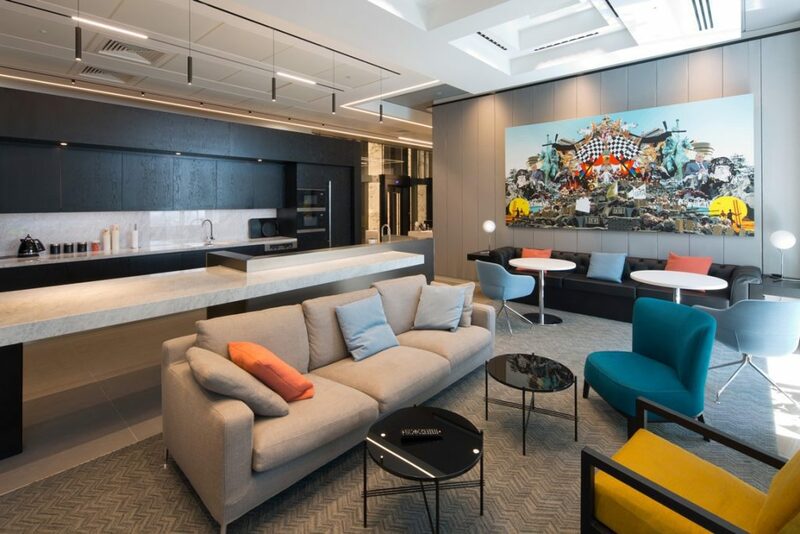 As the workplace evolves and office design follows suit, more and more elements traditionally associated with the home are finding their way into the office environment. WeWork are seen by many to be responsible for numerous office design trends including this one, and with the introduction en-masse of comfy and colourful couches, armchairs and lampshades into the workplace. It is however a trend that has been in evidence for some time, albeit WeWork has come to embody it in its purest sense. We have witnessed the introduction of warm, homely areas in the workplace complete with colourful couches, coffee tables and cushions designed so staff can unwind, relax and digitally detox, so they can be at their productive and creative best. This realisation that staff need a dedicated space to unwind and destress is on the rise and is something we expect to see more of – allowing staff to be at the creative best. Alongside this, the use of and introduction of warm colours, otherwise used on sitting room walls, into the workplace to denote areas intended for staff to relax are here to stay, for the time being at least. It is not just furniture that the home is influencing as we are also seeing the addition of features like artwork playing prominent roles in the office design process, as well as decorative lamps and recessed lighting features, all of which add homely touches. The kitchen or breakout area is also seeing more influence from the home with readily available snacks, great quality tea and coffee and fresh fruit now readily available in many offices as ‘the kitchen becomes the heart of the office’. Don’t be surprised if you see ‘Home Sweet Office’ signs as you enter the office in the future. 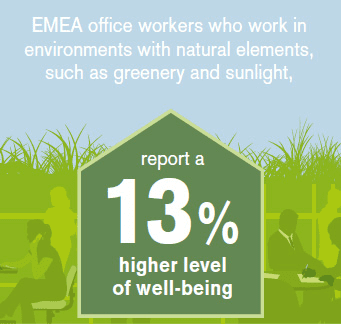 As more and more studies highlight the benefits of including plant life in the workplace, such as increased oxygen levels that aid concentration and improved air quality that pretty much benefits everybody, we’re likely to see more of the outdoors moving indoors. Biophilic design is in its simplest definition, the embedding of nature in the workplace so it can greatly improve the health and happiness of the workforce. With regard to office design, this can mean the installation of living walls, water features or even indoor gardens in the workplace. Once considered a luxury, biophilic office design is now becoming far more common with many commentators and industry figures predicting that it will grow in popularity. It doesn’t mean that you need to go out and get a living wall or fountain installed straight away, a much simpler solution is to include plant life and natural flowers within the workplace, just speak with a local florist and arrange regular deliveries. Other companies focus on creating an environment that maximises natural light, with views of the outside environment proven to increase productivity while many design firms are currently exploring new and innovative ways of incorporating biophilic design into the modern workplace. Expect to hear more about this as 2017 progresses, as this really is one of the major office design trends. Workplace wellbeing has been around forever or so it seems, and while once seen as a fad, it is now becoming the accepted norm in organisations of all sizes. More and more companies are embracing proactive workplace wellbeing programmes and promoting it as part of the employment package in what is a particularly competitive market to attract the best talent. Great staff want to work in the best possible environment and as a result workplace wellbeing has shifted towards the top of the agenda. The future workplace will further embrace wellbeing and in time, we could start to see the transformation of the traditional HR role and the emergence of a wellbeing function within the office. So, how is workplace wellbeing being embraced and what can we expect to see more of? There is no simple answer here as workplace wellbeing tends to mean different things to different organisations. For larger employers, it can mean including a gym facility for staff to providing sit stand desking solutions that promote increased movement, and less sedentary working. For others, it can mean the inclusion of bike storage and showers to encourage cycling to work and in some cases, lunchtime running clubs. What we will certainly see more of, is companies encouraging staff to get up and move around the workplace and as such sit stand desk solutions are becoming hugely popular as are standing meetings which have proven to be shorter, yet more efficient. The standing workplace is something to watch out for. The workplace of today centres around the individual and this is not likely to change any time soon as workplace wellbeing grows in importance. Companies have also grown to understand that workplace induced stress is the biggest health related issue that employees face and consequentially, they are working to create a more relaxed and healthier work environment for everyone. As office rents increase and personal space for each employee decreases, many organisations are adopting an evidence based office design approach, where a lot of effort is undertaken at the beginning of the process to ascertain what workplace would work best. The evidence based office design approach means that consultants and designers will engage with staff and stakeholders through workshops, utilisation studies and observational analysis to determine what any future workplace needs to deliver. From these various channels, evidence is gathered which is in turn used to influence design so the space can optimised. Workplace strategists and designers will work closely far more than ever before to create initial concepts and space plans that support both the qualitative and quantitative data previously gathered. While the approach isn’t ‘new’, we do feel that it will grow in importance and increasingly become the ‘norm’ during 2017 and beyond. A well-designed workplace will understand where staff spend their time, who works closely with who and the types of spaces people need. The rise of evidence based office design is helping designers to create workplaces with hard evidence, rather than on the assumptions and opinions of senior stakeholders, which can sometimes be detached from the reality. Evidence based office design will grow in importance as companies strive to design offices that truly work and that provide staff with the necessary tools and space to be productive. The workplace will continue to change as technology advances and as new, innovative ways of working are more widely introduced. In twelve months, we could be talking about a radically different set of office design trends that we haven’t referenced and that’s what makes working in office design so exciting. For the first time, the workplace is now home to four different generations and while much has been made of this fact, with plenty of discussion about how different working styles can be accommodated, it has emerged that the key is to simply create a flexible, welcoming place to work and providing staff with the tools and space to work as effectively as possible. However, how this looks for each organisation will differ and is where the real question and challenge for office design rests. 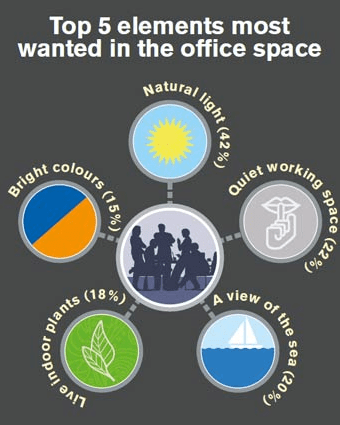 Ask yourself what type of office your staff require? What tools do they need? And how could we create a more welcoming workplace? These are the first questions you’ll need to answer to create your amazing new workplace. 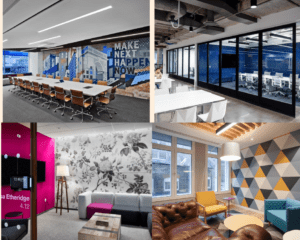 We hope you enjoy reading our views on office design trends and if you need any help with your own office, don’t hesitate to get in touch at hello@k2-space.co.uk. The workplace is evolving rapidly so our experts have taken a look at current office design trends.